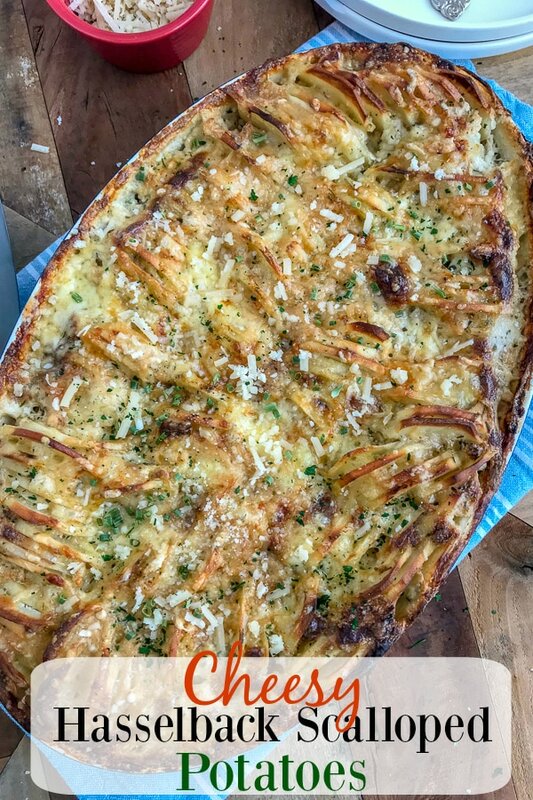 Cheesy Hasselback Potatoes – an incredibly delicious au gratin style hasselback potato dish that is perfect for any occasion. Even the upcoming holidays! Made with garlic, thyme, half & half, and a three-cheese blend of: parmigiana reggiano, sharp cheddar cheese, and gruyere cheese. Simple to make, full of flavor and sure to be a show stopper on your upcoming holiday table spread! If there is one vegetable that is universally loved among all age groups, all around the world, and in just about any form – it’s the potato. Whether its fried, baked, mashed, stuffed, etc. – it’s simply a delicious ingredient to any recipe. I haven’t met a potato prepared in any certain way that I did not love. Especially my recently added and now super popular Super Crispy Garlic Parmesan Potato Bites. Clearly I love potatoes in crispy form best. Which explains this dish! Crispy on the top, tender and flaky on the inside. Let’s not forget the cheese! And with the holidays fast approaching us all, I knew I had to make a dish that would please not just my family, but hopefully yours as well. Because what Thanksgiving or Christmas goes without some form of a potato side dish or two?? Try this one with your family this holiday season! 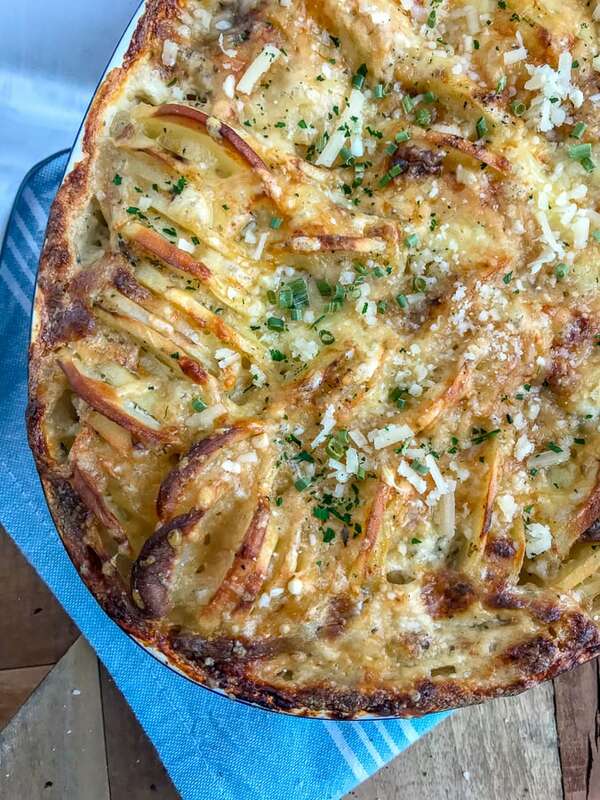 This Cheesy Hasselback Potatoes recipe delivers all the creamy deliciousness of potatoes au gratin, but with a super crispy, cheesy topping. Which I believe only enhances the dish in my honest opinion. Garlic Butter Parmesan Roasted Carrots – Super simple, tender, and flavorful carrots. They make for the perfect side dish to any meal. Garlic Parmesan Mashed Cauliflower – A super simple, quick recipe to make that is the perfect healthy swap for the traditional mashed potatoes! Lower in calories and carbs. Cheesy Broccoli Ham Casserole – Perfect for your leftover ham or turkey from the holidays! 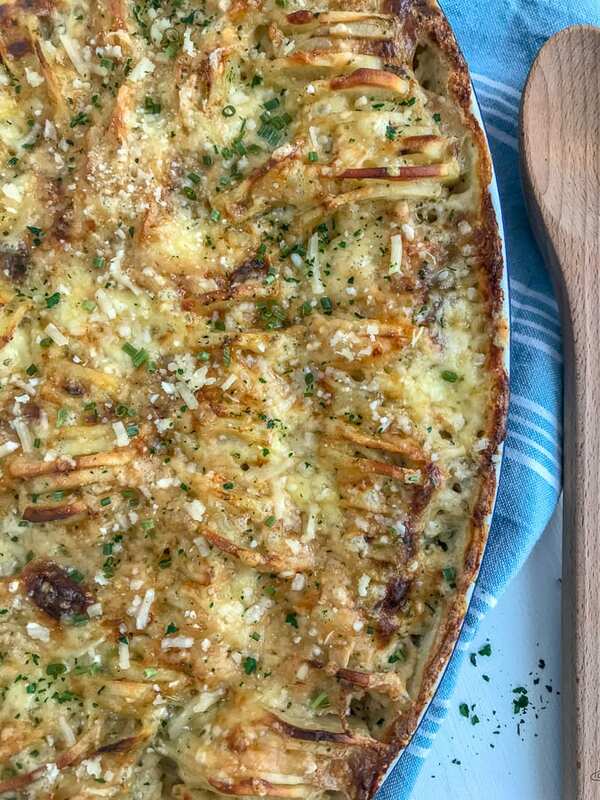 Easy, cheesy, and super delicious side dish with the best, crispy parmesan topping. Super Crispy Garlic Parmesan Potato Bites – Super crispy, super easy, and super delicious. Your kids will love these potato bites. If you’re the type of person that enjoys picking out the extra-crispy fries from a bunch, then these are for you! Creamy Garlic Butter Loaded Mashed Cauliflower – Imagine a loaded baked potato, but in mashed potato form with cauliflower instead of potatoes! 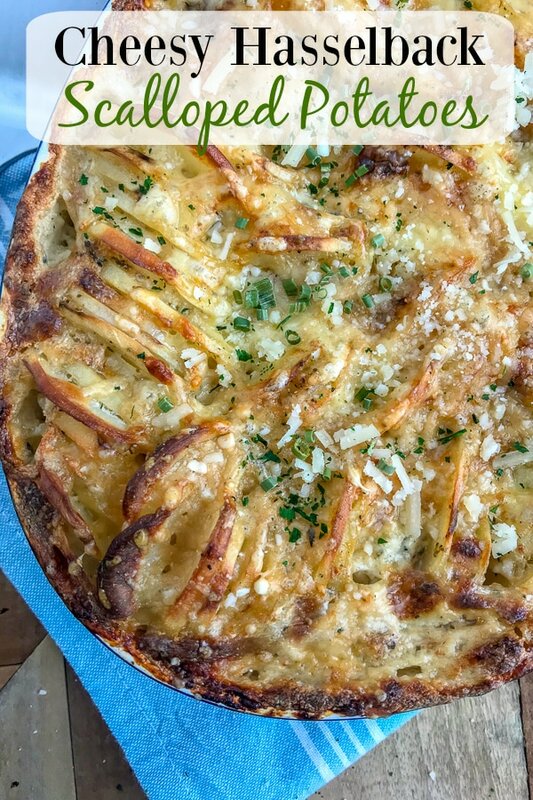 Healthy, easy to make and so yummy you won’t even be able to tell its not made with real potatoes. Prepworks by Progressive Adjust-A-Slice and Julienne Mandolin – This handheld slicer makes prepping this dish so very easy. I use this mandolin slicer for slicing vegetables as it helps to give perfectly even slices every time. OXO Good Grips Box Grater – Works like a charm to collect and measure the cheese you grate. 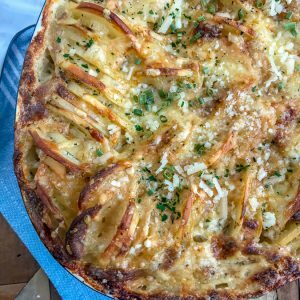 An easy, flavorful dish that combines the traditional au gratin potatoes with the cheesy, crispy style of hasselback potatoes. Sure to be a hit at your next family function or pot luck! Preheat oven to 400 degrees F. Coat a deep baking dish (I used a 13" x 8" dish) with the butter. Combine the cheeses into a large mixing bowl. Remove 1/3 of the cheese to a separate bowl and set aside. Add in the half and half, salt, pepper, garlic powder, onion powder, and thyme to the remaining cheese mixture. Add the potato slices and toss to thoroughly coat, making sure to get every potato slice. 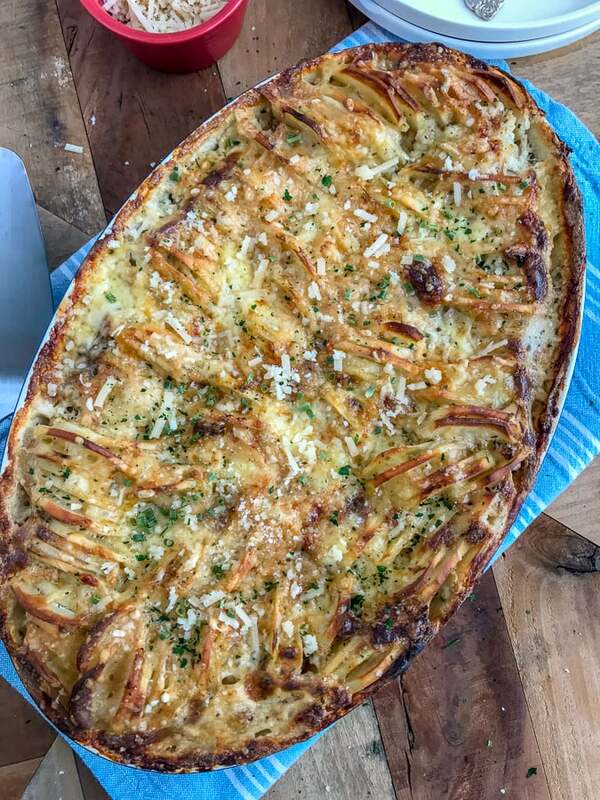 Grab a handful of potato slices and add them to the prepared baking dish in a stack. Start by lining them up along the edge, creating a circle around the dish. Continue lining up the potato slices until the entire casserole dish is full and tightly packed. Depending on your dish, you may need to peel and slice an additional potato or two to fill the dish. Pour whatever cream and cheese mixture is left in the mixing bowl over the top of the potato slices. Don't fill the dish all the way full. You want the liquid to fill half the dish. Discard any leftover liquid. Cover the baking dish with aluminum foil and bake for 30 minutes. Remove the dish from the oven to remove the foil and return it to bake for an additional 30 minutes. Add the remaining shredded cheese to the top and return to bake 20-30 more minutes. Or until the top of the potatoes has reached a crispy, golden brown. Allow the potatoes to rest for 5 minutes before slicing into. Garnish with additional thyme, chives, or grated parmesan cheese.